It isn’t often that I get to take a break from meal planning, shopping & cooking. Because of our dietary restrictions, going out to eat rarely happens… Even going over to a friends house typically means bringing our own special foods. So, when I came across Sun Basket, a Fresh Meal Delivery Service that offered Gluten Free, Dairy Free, Egg Free, Vegan & Paleo Options, I was excited to give them a try! Just so you know, this is not a sponsored post… But, I have shared my affiliate links that will give you $40 Off your first Sun Basket Order and $20 off your second and $20 off your third if you want to try Sun Basket for yourself. As always, the opinions I share on this site (both negative & positive) are totally mine. 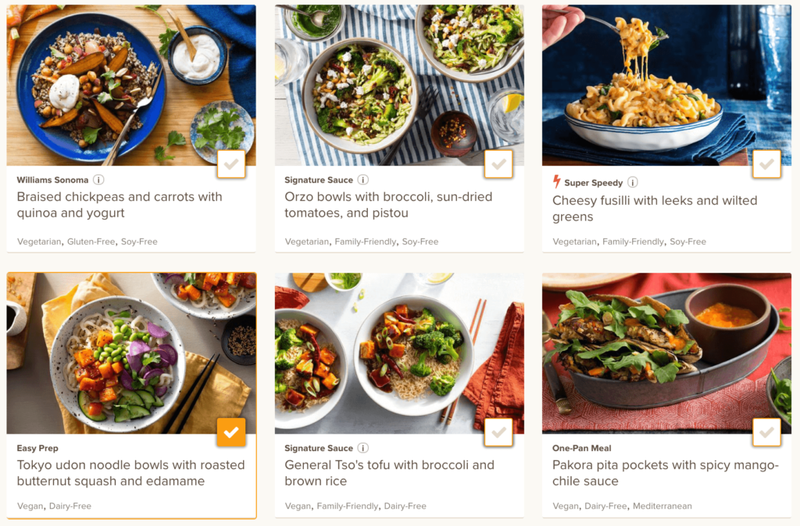 The really cool thing about Sun Basket, is that you’re not stuck with just a couple of options… They actually have many Gluten Free, Vegan, and Paleo friendly choices – Plus, you can mix and match within those categories based on which recipes you think you’ll enjoy the most. I love how they tag each of the meals with the special dietary needs. The other part I really like is that Sun Basket sources Organic Produce and Clean Food from real farmers – You can even learn more about where your food is coming from. Sun Basket offers two different Menu Choices: Classic Menu or Family Menu… I went with the Classic Menu option because this allowed me to pick any of the 18 meal choices offered. Personally. 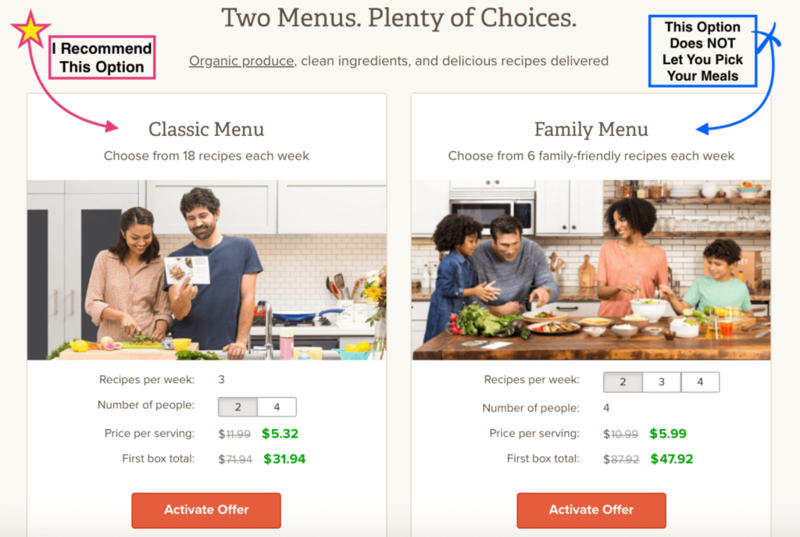 I would not choose the Family Menu option because you do not get to pick your meals – they are chosen for you and many are not Gluten Free or Vegan. If you’re like me and want to try Sun Basket for yourself, Here is a coupon for $40 off your first Order PLUS $20 off your second! Note: The link will activate the coupon, but it’s only good for first time customers. I wish there was a way to easily see what the ingredients are used when choosing a meal. You can go to the recipe page & see all the ingredients listed, but it would be much more convenient to have it right on the menu selection page. Cancelling is easy if you decide you don’t like the service… But, you have to remember to do it at least one week prior (before the Wednesday cutoff). So that makes trying the service a little tricky if you decide you don’t like it – You might be stuck with two boxes before the cancel takes effect. The work around for this is to immediately pause or skip the following week so you have time to decide. I have a large family, so the Family Option would seem like a logical choice… But, this option doesn’t let you choose the meals – that was kind of a bummer. There is a chance of cross-contamination for Celiac’s since both Gluten Free & Non Gluten Free meals are prepared in the same place. This can be a scary risk to take for some. 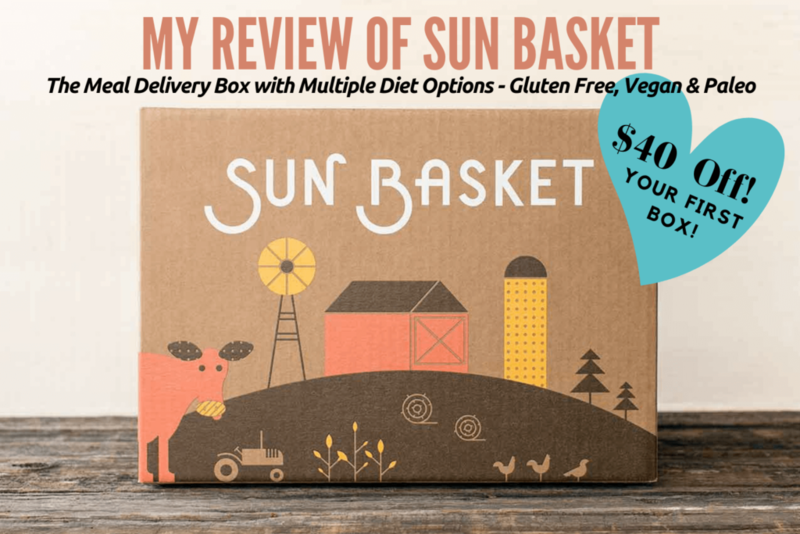 My first Sun Basket box is scheduled to arrive in a couple of weeks… I’m super excited to try it out & do a follow-up review. I’d love to hear if any of you have tried the service yet… Please leave me a comment on what you thought… good or bad! If you’re like me and want to try Sun Basket for yourself, Here is a coupon for $40 off your first Order PLUS $20 off your second & third boxes! Note: The link will activate the coupon, but it’s only good for first time customers. Oh, and if you have kiddos, be sure to get them involved and let them pick a meal or two. My boys love to help me cook & I find that they are willing to try new & healthy things when they get to be a part of the whole process. « Stitch Fix Coupon Code 2019 – Get $25 Off your First Fix!! Interesting and if they were truly gluten free I would try it, BUT chance of cross contamination is too risky because I have celiac. I don’t know how they can call them gluten free if that is the case.